2 Winners for Guess that Kitten and New Rules for the CryptoKitties Contests! Congrats to the Guess that Kitten Winners @justdik and @ngfx who tied with 5/8 Cattributes correct. @justdik posted earlier so they win the parents https://www.cryptokitties.co/kitty/439886 and https://www.cryptokitties.co/kitty/447211 @ngfx wins the Kitten https://www.cryptokitties.co/kitty/458205 . I have decided to change the tie breaker rules. The comment with the most upvotes will win tie breakers which seem to happen pretty often. The Random Kitty Contest will now become the Upvote Kitty Contest. The comment with a Kitty Litter Address that has the most upvotes will recieve the Free Kitten. My upvote will count too so make sure you upvote the post and I will upvote your comment! Don't forget to enter our Upvote Kitty Contest, just follow, resteem, upvote, and comment with your CryptoKitties Litter Wallet Address! The comment with the most upvotes wins the Kitty! Get in Early. These are games are still Pre-Launch! AWESOME!!! i cannot believe i won! :D thanks @brittuf you absolute legend!!! 0x36ed2d75a82e180e0871456b15c239b73b4ee9f4 do u need this? how does it work? I'll eventually send them to you. MetaMask hasn't been working for me today, but I'll figure it out. ok cool, thanks mate!!! :D have a good one!! It seems like this contest is rigged so that the person with the most friends wins. I didn't intend for it to come off as negative -- just commenting my opinion on your change from random choice to most votes. I think most votes could be gamed. If the same person kept winning, I would just change the rules. Sorry to jump on you about it, but so many conspiracies these days. Wohoo I got the tiny kitty, thanks! Kitties are dope! Someone interested? https://www.cryptokitties.co/kitty/136713 First come first serve! One day in the future if I win a cryptokitty I'd like to give it to a charitable cause. Good luck everyone! This post has received a 1.80 % upvote from @booster thanks to: @brittuf. You got a 9.19% upvote from @postpromoter courtesy of @brittuf! Want to promote your posts too? Check out the Steem Bot Tracker website for more info. If you would like to support development of @postpromoter and the bot tracker please vote for @yabapmatt for witness! You got a 8.34% upvote from @upme requested by: @brittuf. Congratulations @brittuf, this post is the ninth most rewarded post (based on pending payouts) in the last 12 hours written by a Hero account holder (accounts that hold between 10 and 100 Mega Vests). The total number of posts by Hero account holders during this period was 414 and the total pending payments to posts in this category was $12769.65. To see the full list of highest paid posts across all accounts categories, click here. @brittuf .. 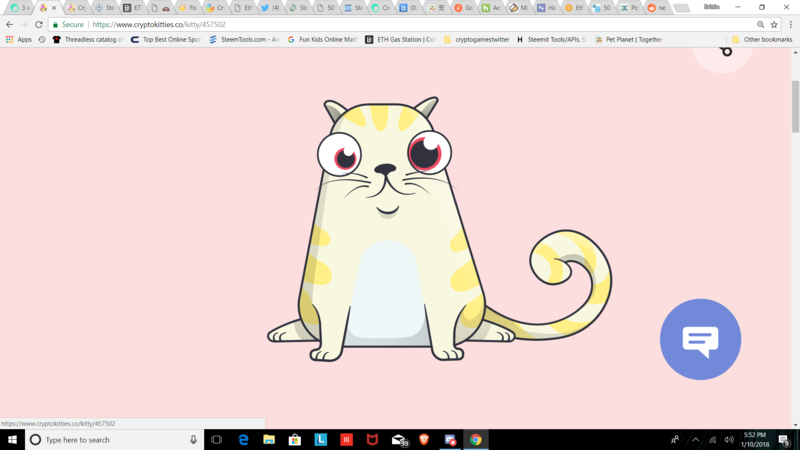 I'm pleasantly surprised that Crypto kitties are still in demand.. thought it was a passing fad.. I don't even know what crypto kitties are and I should even get an address.